...but after the news that he switched to jackson, ibanez is just going down for me. I love IBANEZ because I love IBANEZ. Not because Steve Vai or Buz McGrath or someone else plays on them. If IBANEZ lost some Artists, IBANEZ never going down for me. Because I love IBANEZ guitars. I think Dave Weiner did but I can't rightly recall what the reason was. Interesting. I can respect that. It's definitely evident from his latest album that his style is changing and going a different direction. Makes sense. Honestly, I wouldn't switch from Ibaenz if Joe, Steve, AND Paul left as long as they still made my favorite guitars. I know I cry about it a lot here, but the dollar-yen thing is a nasty battle. I have to take my hat off to Ibanez for still putting out a good product in the face of that. Doing things like getting rid of Edge or Edge Pro and replacing it with Edge Zero... not really good in my book. The fact that Ibanez's 2 biggest artists DON'T use Edge Zero on their sigs is not good either! Just my $0.02 if you're reading, Ibanez. ibanez makes amazing guitars and their custom shop is phenomenal !! i switched to ESP because they give their artists /band more visibility. in addition to being a fan of ESP guitars i felt like i wanted to try something fresh with a new company. But seriously, thanks for clearing that up, buzz! I've got to say I've never played an Ibanez guitar because some pro used them. I played them because I liked them. The most famous Ibanez of all is a Jem and realistically it is really not much different than a standard production guitar with some fancy routing, inlays and paintjobs. Every manufacturer seems to have a very distinct feel and I've always been a fan of what Ibanez has done. The only thing I question from this thread is the comment that LACS won't make a custom model that isn't based on a production guitar. Isn't that what a Jem originally was? Certainly a Voyager was not even remotely similar to a production guitar. Yes, thanks for commenting Buzz. I'm not a fan of ESP but congrats on the endorsement and I hope it works out well for you. Probably tons easier for a 'A' endorsee to get something like that done than a 'B' or 'C' line endorsee. Steve will always be Ibby's #1 guy. He could probably get them to make a 10 neck monster that would eat Rick Neilsen's 5 neck beast. I think a voyager is actually fairly similar to an old EX body shape witha huge chunk cut out of it, but I've never had the two side by side to compare. And the JEM wasn't so much as an artist custom shop one off as trying to relauch the whole brand of Ibanez into the market at a higher tier. I think the whoel thing about staying line with production guitars is for the artist customs as opposed to prototypes ofr new lines and so on. James (7 dying trees) from Cradle of filth has just got a new custom that's a "bit" like a xiphos but still considerably different - maybe his own signature model? who knows? As far as I understand, the Voyager is the most out there of all the artist designs (although you could have a chicken and egg argument with the Jem and the RG). 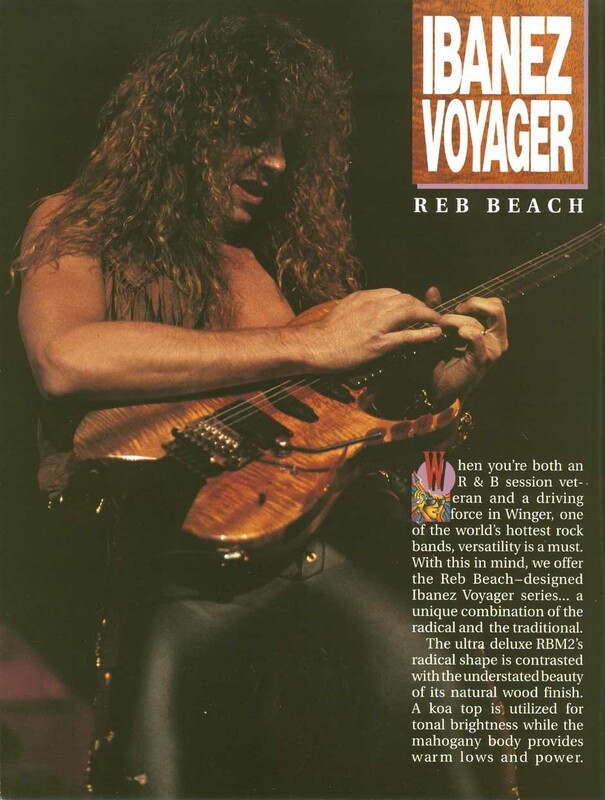 The story goes that Reb Beach dreamed it up on a ****tail napkin and had Mace Bailey build it for him. The body is much more than just an RG with a chunk cut out of the back (which is the mistake those idiot eBay sellers like Legacy make). The upper and lower horns are shaped completely differently. It's too bad that the prototype horns were likely deemed unsuitable for production, because the production ones are much less pointy and less aggressive than Reb's actual guitars (not to mention the much higher grade of koa on the prototypes). You can see the original prototype in this pic with much more pointy horns, super thick flamed koa top, the 5-way and coil tap switches in a totally different spot, no pickguard and the input jack in the standard location. Damn! I'd buy one of those if they were in the current lineup, and I bet I wouldn't be the only one.